When properly prepared, chicken makes up part of a healthy, low calorie diet. Skinless white chicken is high in protein and low in fat. Before you can plan what to include in your MyPlate healthy meal plan, you need to determine proper serving sizes -- the units that build the diet. According to the U.S. Department of Agriculture's ChooseMyPlate.gov, the serving size for chicken is 1 oz. A cooked boneless skinless chicken breast is equivalent to 3 oz. of protein. The USDA recommends that healthy adult men should consume approximately 6 1/2 oz. of protein-rich foods daily, while women should have about 5 1/2 oz. A serving of chicken is equivalent to 1 oz. of cooked meat or fish, one egg, 1/4 cup of cooked beans or 1/2 oz. of nuts. One 3 oz. serving of roasted chicken breast without the skin contains about 140 calories and 5 g of fat, about 1 g of it saturated fat, and 70 mg of cholesterol. The same size serving of a chicken drumstick with the skin, battered and fried, contains about 230 calories and 15 g of fat, about 4 g of it saturated, as well as 75 mg of cholesterol. How you cook a serving of chicken can significantly influence its calorie, total fat and saturated fat content. Eating 3 oz. 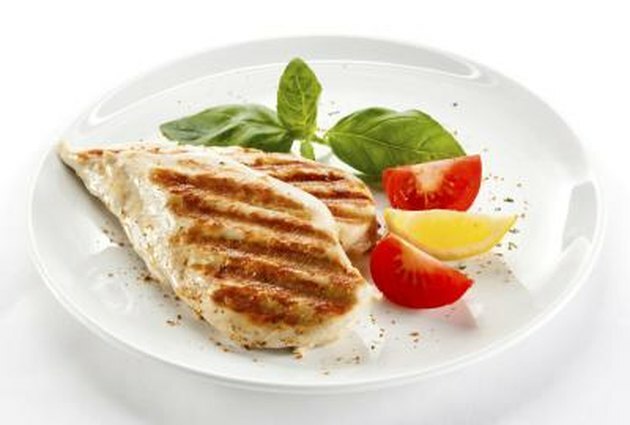 of boneless skinless chicken breast that's been grilled will provide you with 128 calories, 2.7 g of fat and 0.8 g of saturated fat. By contrast, consuming the same amount of chicken breast fried will give you 161 calories, 4 g of fat and 1.1 g of saturated fat. For the most nutritious serving of chicken, prepare it without any skin; grill it so any extra fat or grease drains off; and use only low-fat and low-sodium breading, marinades and sauces. In addition, opt for chicken that has not been injected with a saline solution whenever possible. Chicken that's been enhanced in this way can contain up to 500 percent more sodium per serving than fresh, untreated chicken.